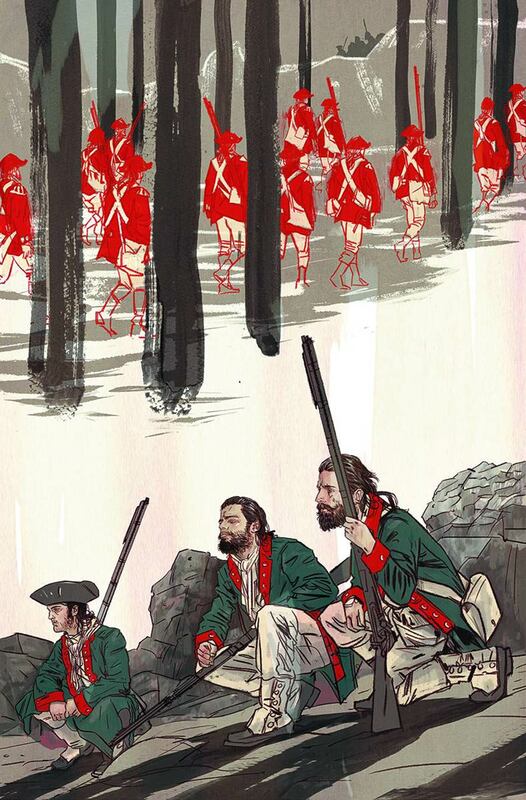 Eisner-nominated writer Brian Wood (Northlanders, Moon Knight) returns to historical comics fiction this week with a journey through the New Hampshire backwoods chronicling the dawning of the American Revolution. Told from the point of view of Seth Abbott, leader of one of the first homegrown rebel militias to fight the English, this new creator-owned series with Andrea Mutti (Batman Eternal), promises loads of buckshot-fueled action and historical intrigue. The first issue takes pains to differentiate itself from the negative connotations of modern militias in the frontispiece but in doing so evokes the spectre of the very overzealous religious and anti-government zealots it’s trying to distance itself from. Despite this, Rebels is an almost operatic version of the first days of the Revolutionary War, featuring stunning, richly detailed artwork from Mutti and award-winning colorist Jordie Bellaire. If Wood’s previous forays into historical fiction are your cup of tea, or you can’t wait for the second season of AMC’s Turn, then Rebels is definitely the series for you. Before anything else, everyone here at Broken Frontier would like to offer our condolences to artist Wilfredo Torres, who recently lost his wife Monica to cancer. In a heartening demonstration of the comics world pulling together rather trying to pull itself apart, a number of artists have produced work to be auctioned to support Wilfredo and his family: check out #TorresBenefit on social media. Of course, a simple way we can all support Wilfredo Torres is by picking up his work, and this opening issue of his collaboration with Mark Millar is a perfect showcase for his lovely clean style, capturing the style and elegance of the mid-century modern era, from Hollywood to Madison Avenue. 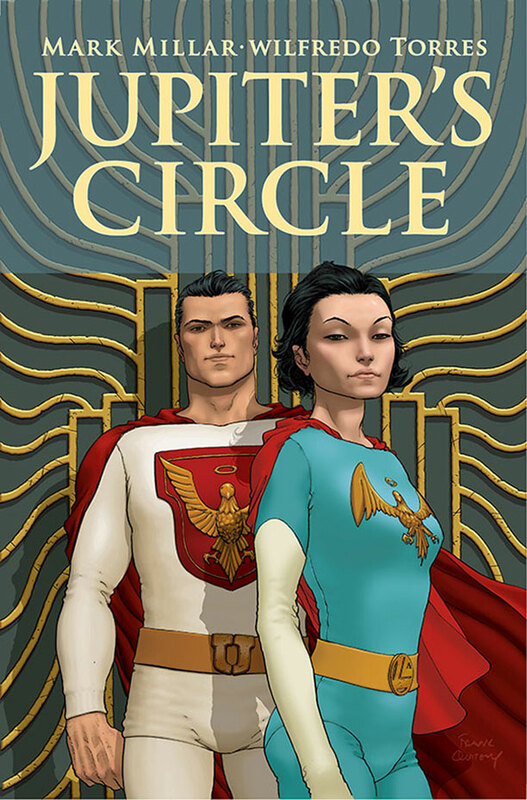 Fitting in as an ‘act break’ between the two halves of Jupiter’s Legacy, this 10-parter goes back a generation, looking at the personal lives and relationships behind the 20th century’s most celebrated superheroes. The first storyline focuses on Blue Bolt – a publicly closeted hero whose homosexuality creates another secret identity for him to conceal. With its humanity and sense of time and place, this looks like another Mark Millar comic for people who don’t like Mark Millar comics. The hit indie series that put Tradd Moore (Ghost Rider) and Justin Jordan (Spread) on the map returns for the final installment of the trilogy. Luther Strode was a puny high school geek who couldn’t talk to girls until he sent away for “The Hurcules” muscle-building method he saw advertised on the back of the comic. But the program he receives turns out to be the training manual for an ancient murder cult. Now Luther has the girl and more strength than he bargained for, but he must also deal with the burden of figuring out the most responsible way to use of his new powers. Oh, and it turns out that these new powers also come with his very own murderous arch-enemy. At the opening of this new series, Luther and Petra have been on the run for five years but their days on road are over. It’s time for Luther to take down the Murder Cult once and for all. The road to Cain starts here. 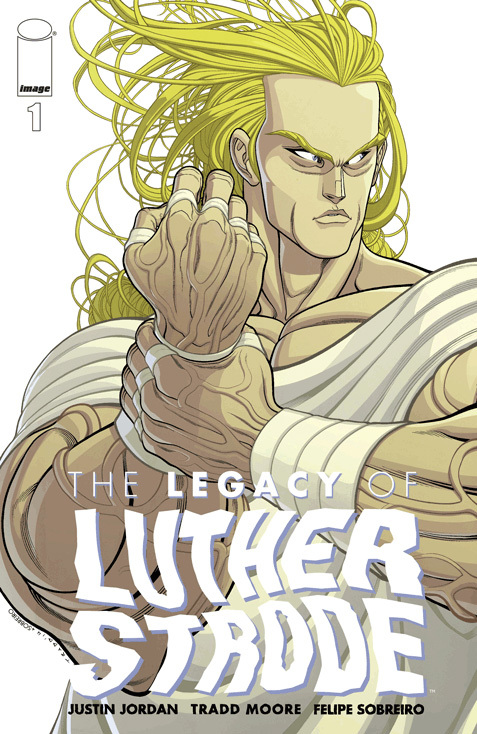 Justin Jordan’s Luther Strode trilogy begins its conclusion today, but his Boom! Studios sleeper hit is just getting started. The first arc ended with a bomb drop that turned Jordan’s X-Files-channeling sci-mystery homage into…well, no one’s sure just what yet, but definitely a title holding its own against its distinguished forbears. Larger plot aside, this issue kicks off an arc with a great hook of its own: an assassin with a gun whose bullets can travel through time. Jordan’s big ideas are matched by newcomer Ariela Kristantina’s superb art, which blends manga and European influences in its pulp-flavored petri dish. Boom! has produced a disproportionate number of my Staff Picks, and Deep State is further proof of the publisher’s ever-broadening lineup of stellar titles. The company also deserves kudos for making it easy to catch up on previous volumes, with this series’ first arc available next week for a paltry $9.99. In this pre-Flashpoint story, Superman is powerless and called upon to save Gotham City and his very pregnant wife—Lois Lane. With Convergence, DC Comics has promised us a crossover event filled with lost worlds and timelines that were never followed. And information beyond that has been scarce for the first issues in the series. “What if?” seems to be the overarching question presented to each of the creative teams responsible for the adventures of Convergence. And “Why not?” seems to be reason enough to dive into DC’s first big event of 2015. If you like the idea of Superman and Lois Lane as a couple—and let’s face it, the latest pairing of these characters by Greg Pak in Superman/Batman was beautifully depicted—then this book is a good place to start your trip through all of the memory lanes that weren’t.